If for whatsoever reason you need to undo (i.e. restore) the password that was reset or modified earlier, on the second step of the Wizard, provide the application with the *.puc file with undo sessions. 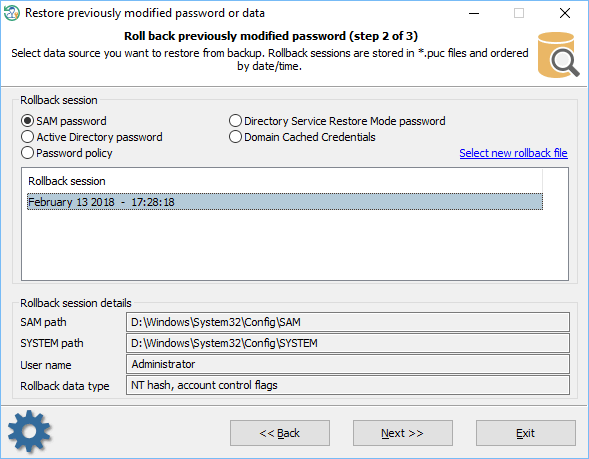 Activate the type of the password to be restored: regular SAM account password, Active Directory, DSRM password or domain cached credentials, password policy settings. After that, select the date when the change was made. Data to be restored. That's the data you have modified at some point. Whether or not this undo session has been used already. A computer security expert needs to logon to Windows under a certain account. The password for that account is unknown. At the same time, the account password must remain unmodified. 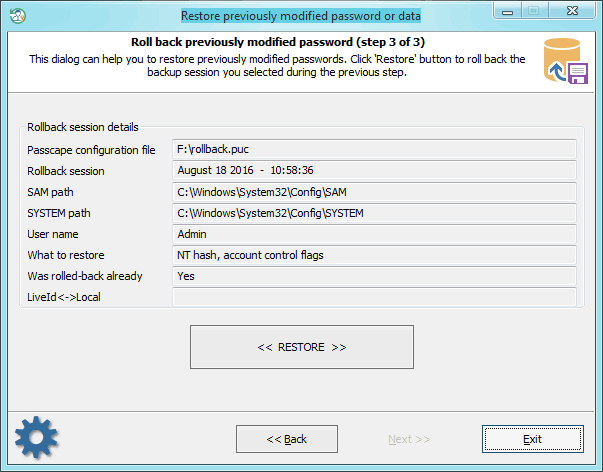 Run Reset Windows Password, select the corresponding account and reset its password. At the same time, save the undo session to a *.puc file (the application will prompt you to do that when you modify the password). Close Reset Windows Password and start Windows. Logon under the modified account with the blank password. Do what you need under that account. Now you need to restore the old account password. For that purpose, reboot once again and launch Reset Windows Password. On the main menu, select 'Restore previously modified password or data', enter the path to the undo file where you have saved the changes you had made. Move on to the third step and make sure that this is the account you need. Click on the <> button, and the old password will be restored.